As reported last October, Arnold Schwarzenegger is planning a big screen return to the Hyborian Age of Robert E. Howard with The Legend of Conan. 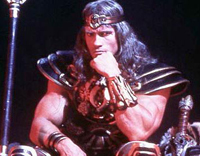 Deadline today reports that Universal Pictures has hired World Trade Center scribe Andrea Berloff to write the continuation of the adventures started in 1984’s Conan the Barbarian. The new film is said to be a direct sequel to Barbarian and will ignore the events of both Conan the Destroyer and of the most recent reboot, 2011’s Conan the Barbarian, which features “Game of Thrones” star Jason Momoa in the lead. Although initial reports had The Legend of Conan on track for a 2014 release, it is a near certainty that the film will arrive in theaters a bit later than that initial estimate.